Red temptation. 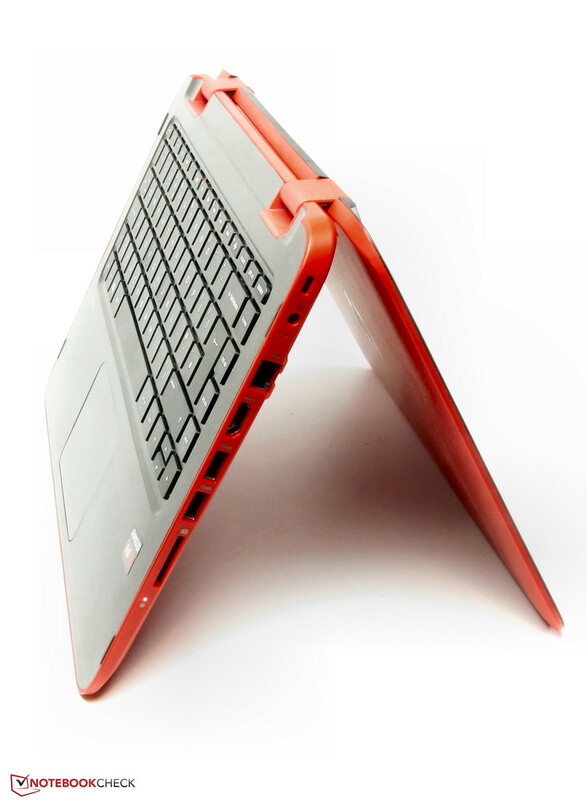 The Pavilion 13 would like to spare buyers the necessity of choosing between tablet and notebook experience by combining both worlds. It is driven by an AMD APU. In addition, it delivers good battery life and plenty of storage space. 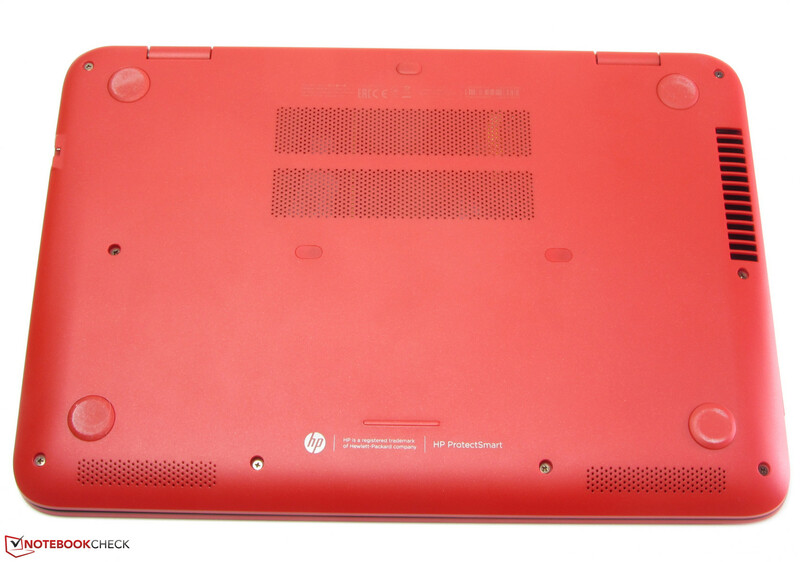 After the Pavilion 13-a000ng, the Pavilion 13-a093na is the second device from HP's 13.3-inch convertible series reviewed by us. 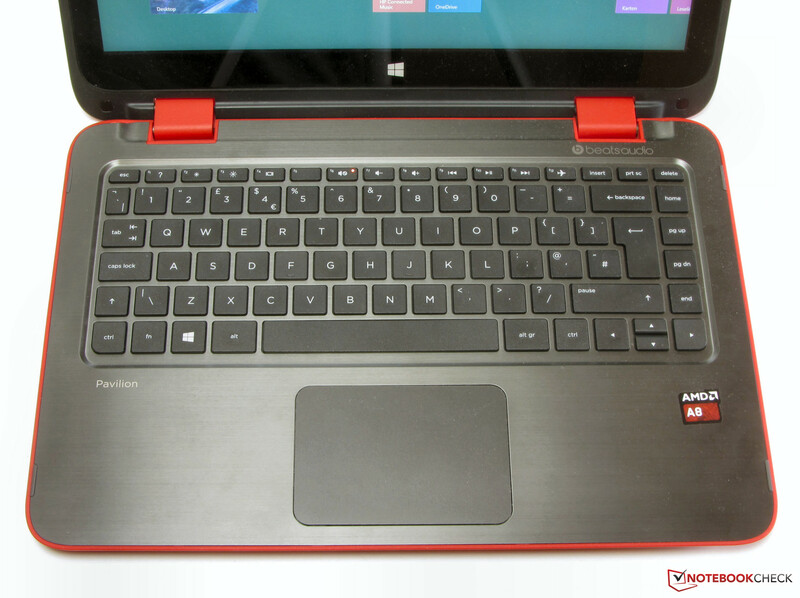 Our test model features an AMD APU, while the sister model comes with an Intel processor. 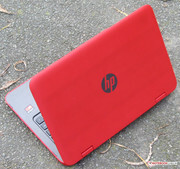 HP also wants to attract buyers of the AMD model with striking colors. 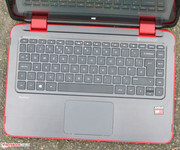 The combination of red and anthracite is really eye-catching. Our review will reveal whether the device also performs well otherwise. 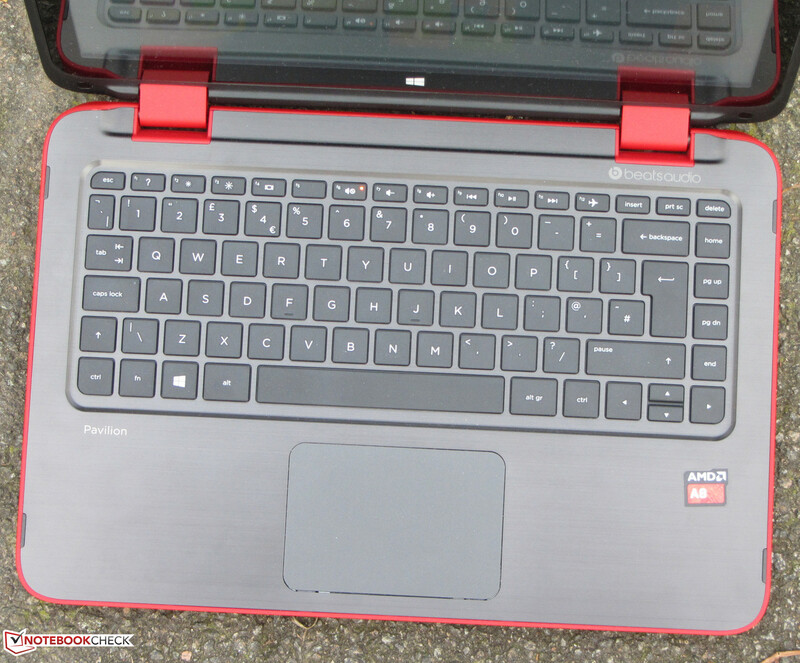 The competition of the Pavilion consists of 13.3 and 14-inch convertibles with a price of about 500 Euros (~$614), for example the Lenovo IdeaPad Flex 14D and the Toshiba Satellite W30Dt-A-100. Since the two Pavilion models use the same design, we will not cover case, features, display, input devices and speakers here. Information about these is available in our Pavilion 13-a000ng review. As already mentioned above, the Pavilion 13-a093na and the Pavilion 13-a000ng use the same design. But, the colors are different. Both computers feature top sides made from metal in dark anthracite. The lid and underside of the Pavilion 13-a093na are from red plastic, while silver-gray plastic is used in the Pavilion 13-a000ng. 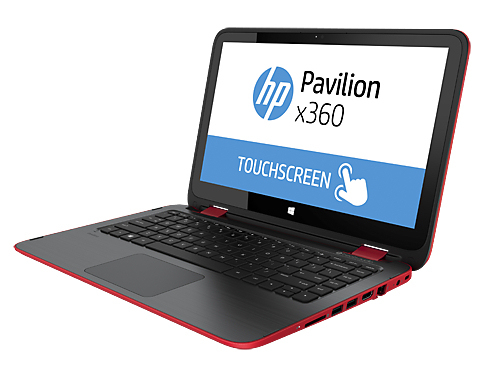 The HP Pavilion 13-a093na x360. A maintenance hatch is missing. The Pavilion 13-a093na features the same display model as the Pavilion 13-a000ng, but the readings are slightly different. Same display models are usually never completely identical. The panels are from Samsung and their brightness is not convincing. They are too dark. The brightness should be at least 200 cd/m² or even better 250 cd/m². In view of the price, contrast and black value are still acceptable. With the Pavilion, HP offers a convertible with a size of 13.3-inches. The incorporated APU brings sufficient performance for office and Internet applications. 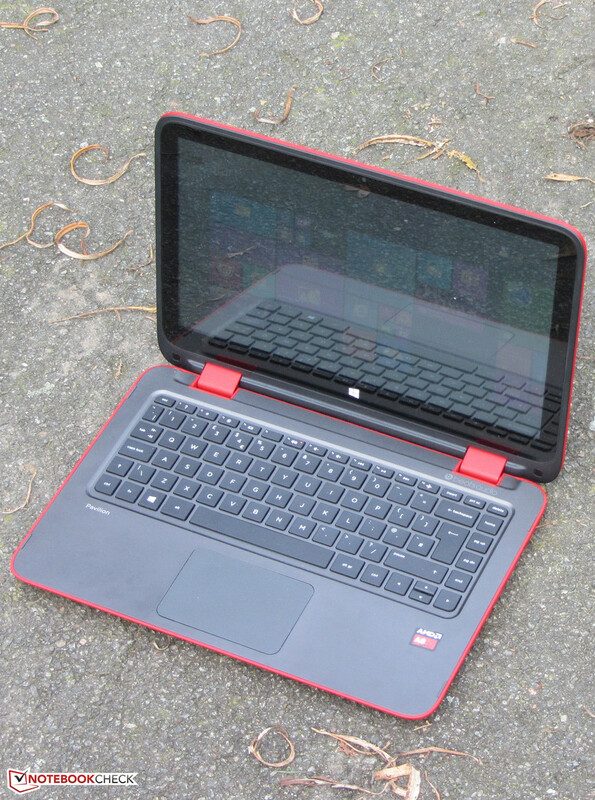 The price of our test model is about 500 to 600 Euros (~$614 to ~$737). It is also available with a silver case. Our test model features an AMD A8-6410 APU (Beema). The quad-core APU uses a base clock of 2 GHz. Thanks to Turbo, the clock rate can be increased to up to 2.4 GHz. 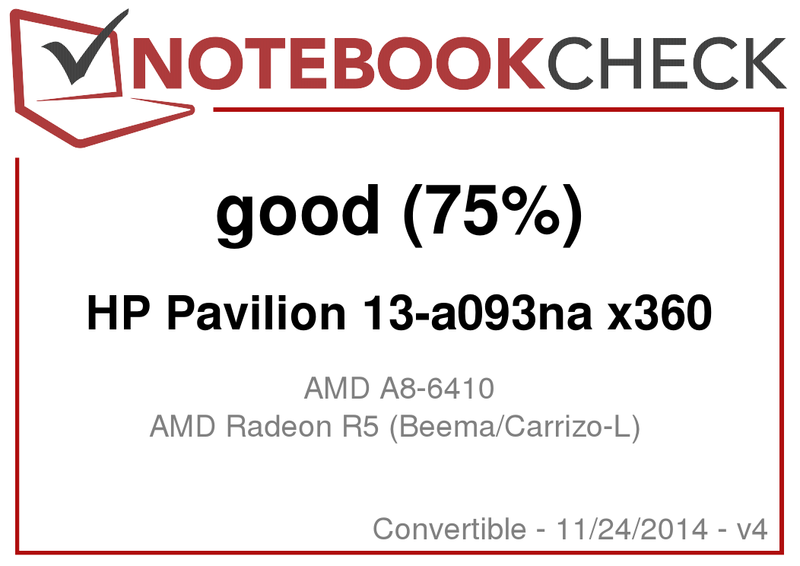 With a TDP of 15 Watt, the APU is quite frugal. In mains operation, the CPU performance is completely available: While the clock rate is 2.4 GHz during the single-thread tests of the Cinebench benchmarks, it is 2 to 2.2 GHz in the multi-thread tests. We found that the clock rate is slightly lower on battery (single: 2.2 to 2.4 GHz; multi: 1.8 to 2 GHz). The performance of the processor is similar to Intel's Haswell ULV Core i3 processors. Actually, only the multi-thread performance is on par, while the Intel CPU performs significantly better in single-thread tasks. The better an app can be parallelized, the smaller the difference between the used AMD APU and a Core i3 processor like the Core i3-4030U. We did not have problems with the Pavilion. It runs smoothly. The results of the PCMark benchmarks are good. The Pavilion falls slightly behind its sister model, since its Core i3 has a higher single-thread performance. The Western Digital hard drive works with a revolution speed of 5400 rpm and features a capacity of 1 TB. So, owners of the computer won't run out of storage space quickly. The readings of the hard drive are absolutely alright and usual for today's 5400 rpm hard drives. AMD's Radeon R5 (Beema) graphics core is responsible for video output. The GPU supports DirectX 11.2 and clocks with up to 800 MHz. The 3DMark benchmarks prove that its performance is about on par with the HD Graphics 4400 in the Pavilion sister model. In dual-channel mode, both Pavilion models would perform slightly better, but, since they only features a single RAM slot, this is not possible. The APU used in the Pavilion 13-a093na only supports single-channel mode, anyway. 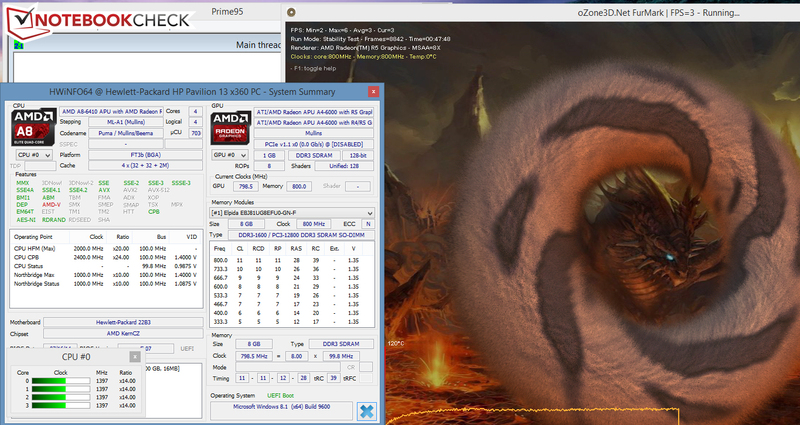 The used AMD APU is able to smoothly run several games in low resolution and low quality settings. Sometimes even medium quality settings are possible. Games with only low hardware requirements should also run with higher settings. Games from the Windows Store run without problems. 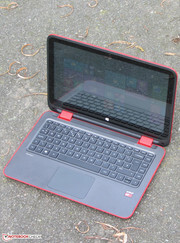 Overall, the gaming performance is similar to the Intel-based sister model's. The latter performs slightly better in CPU intensive games thanks to its slightly faster processor. The fan of the Pavilion runs continuously while idle. The reason is the same as in many other HP devices: The option "Fan always on" is enabled in the BIOS and prevents the fan from resting. If you deactivate this option, the fan sometimes falls silent. The fan does not get too loud under load. During the stress test, we measured a moderate noise level of 37 dB. The Pavilion 13-a000ng gets significantly louder under load. During the stress test (Prime95 and Furmark run for at least one hour), the CPU clocks at 1.4 GHz and the graphics core runs at full speed (800 MHz) in mains operation. 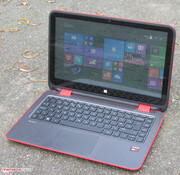 On battery, the CPU clocks at 1.2 and 1.4 GHz and the graphics core clocks at 400 to 500 MHz. The Pavilion does not get too hot. The temperatures remain significantly below 40 °C in all quadrants. The same is also true for the sister model. 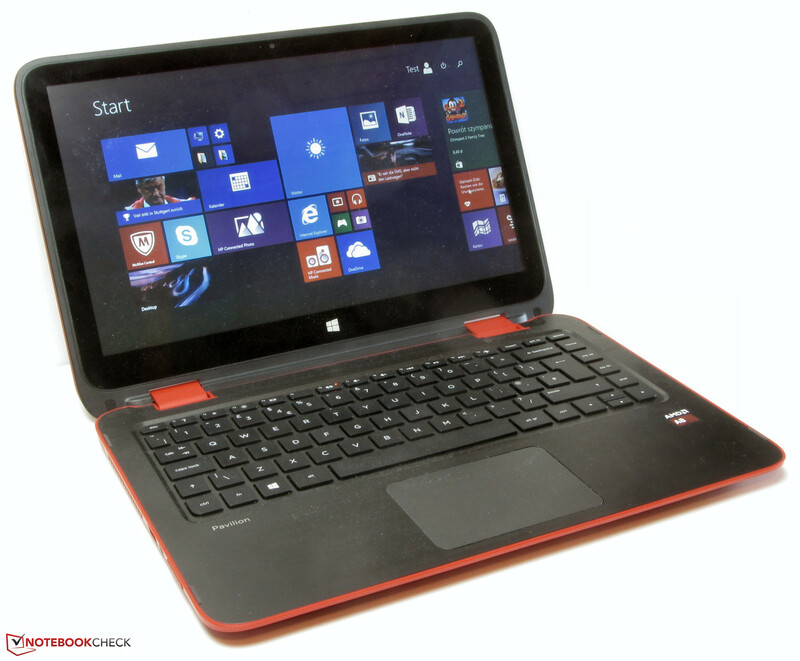 In terms of temperature, the two competitors, the Toshiba Satellite W30Dt-A-100 and the Lenovo IdeaPad Flex 14D are on par with the two Pavilions. (+) The maximum temperature on the upper side is 31.1 °C / 88 F, compared to the average of 35.4 °C / 96 F, ranging from 21.8 to 55.7 °C for the class Convertible. While idle, the power consumption of the Pavilion is below 10 Watt - just like the sister model's. But, they perform differently during the stress test. The Pavilion's consumption of 23.8 Watt is lower than the sister model's (29.7 Watt). The reason is found quickly: The processor of the AMD model is throttled, while the Intel model's isn't. The two competitors, the Toshiba Satellite W30Dt-A-100 and the Lenovo IdeaPad Flex 14D are more frugal under load than the Pavilions. This is not surprising, since both of them use very weak and frugal APUs. 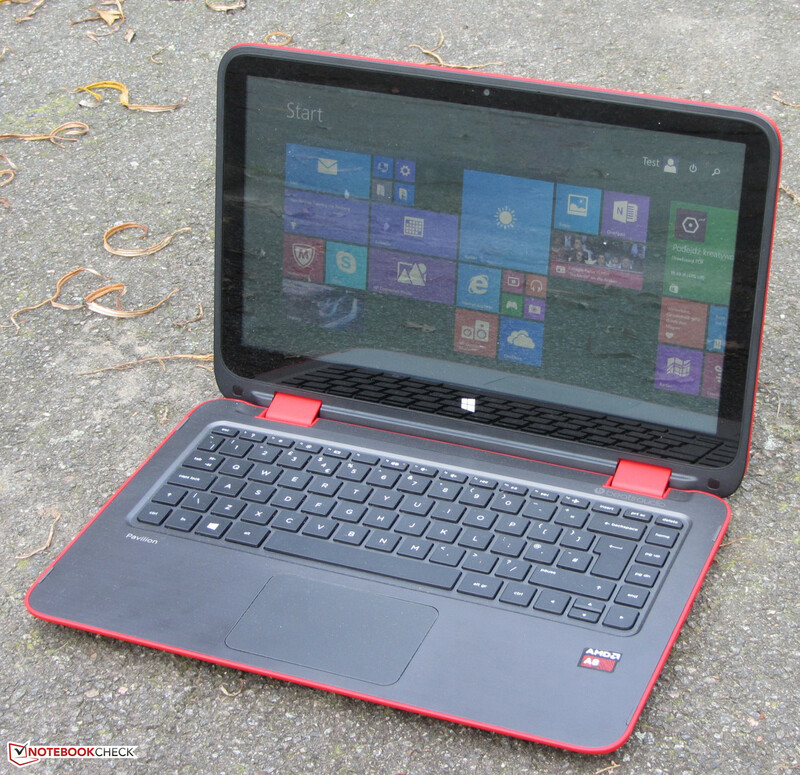 While idle, the battery of the Pavilion lasts 9:48 h. The Toshiba Satellite W30Dt-A-100 (10:50 h) competitor lasts one hour longer. We checked the idle scenario with Battery Eater's Reader's test with minimum display brightness, energy-saving mode and disabled Wi-Fi modules. Under load, the Pavilion shuts down after 2:24 h. The Satellite (3:56 h) also performs better here. We record the battery life under load with the Battery Eater Classic Test with maximum display brightness and enabled Wi-Fi modules. The Pavilion finishes our realistic WLAN test in 5:48 h and ranks in between the Satellite (7:10 h) and the Lenovo IdeaPad Flex 14D (4:51 h). This test automatically loads web pages in 40-second intervals. The energy-saving profile is active and the display brightness is set to about 150 cd/m². We tested the battery life during video playback by continuously looping the short film Big Buck Bunny (H.264 coding, 1920x1080 pixels). The energy-saving profile is selected, the Wi-Fi modules are disabled and the display brightness is set to about 150 cd/m². The Pavilion lasts 5:11 h. We did not run this test on the competitors. Overall, the Pavilion delivers good battery runtimes. The sister model performs better while idle and under load, but the two models are on par in the realistic WLAN test. 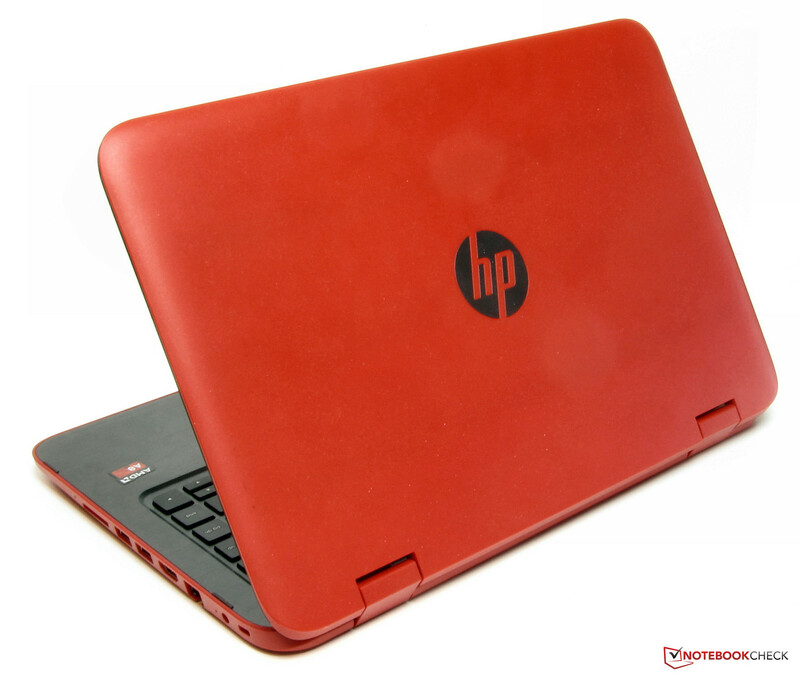 The HP Pavilion 13-a093na is really eye-catching due to the color combination of its case. In contrast, the sister model looks almost boring. Apart from colors, the device can also score points with quiet system noise and very low temperature rise. 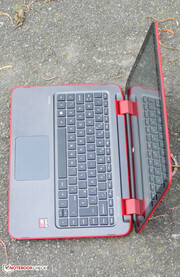 The latter is a very important aspect for a computer which offers a tablet mode. In addition, the system performance is sufficient for usual office and Internet applications. Thanks to a 1 TB hard drive, there is plenty of storage space. Furthermore, the battery life is good. Alike in the sister models, the display is a big disadvantage of the device. 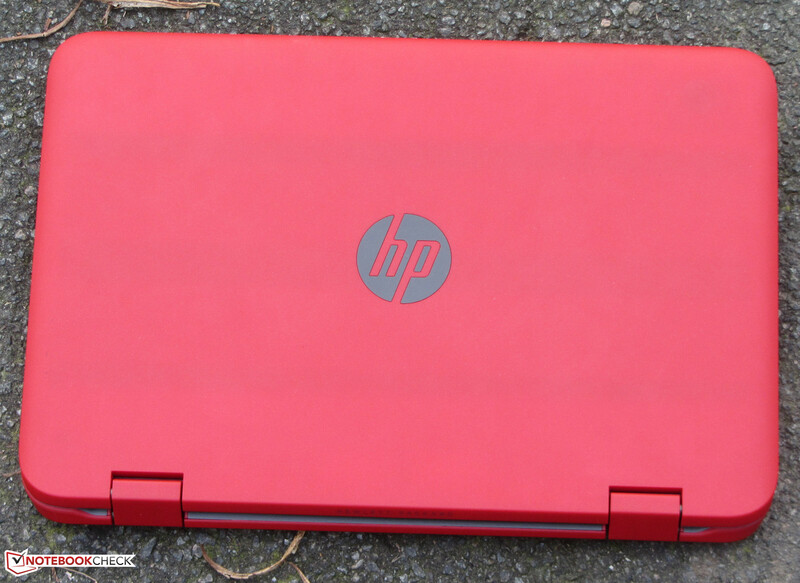 HP used a very dark TN display with narrow viewing angles. 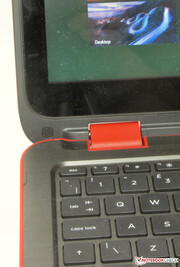 This makes using the tablet mode of this device difficult, since it has to be held at an adequate angle. An IPS panel should have been obligatory. 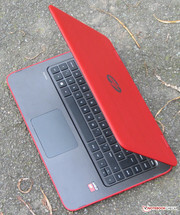 In addition, the Pavilion continues a theme that can recently be found in almost every HP notebook: The warranty is only one year. This is too low. It should be at least two years. 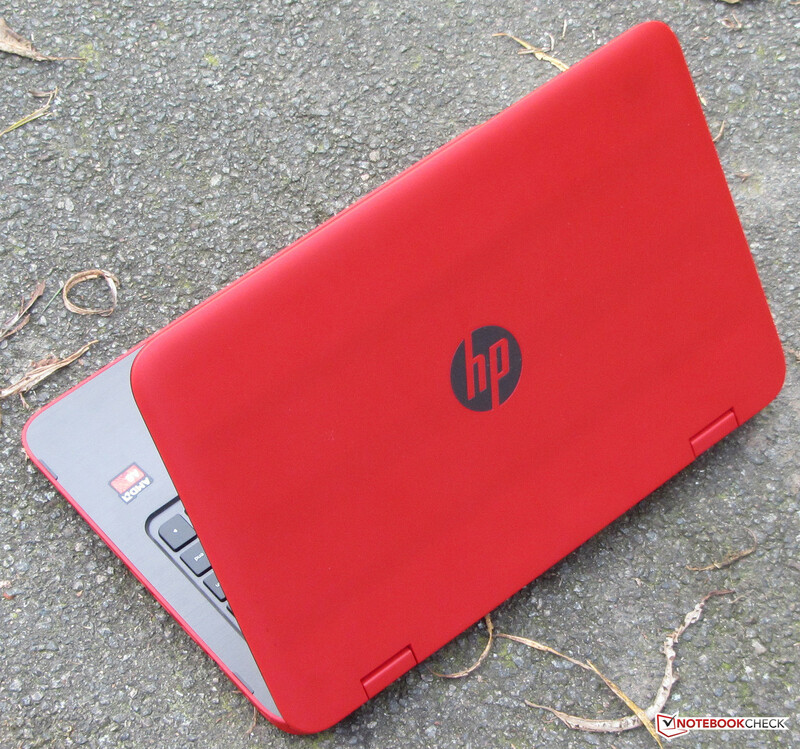 In review: HP Pavilion 13-a093na x360. Test model courtesy of AMD. The computer offers many modes. The upper side of the base unit is made from metal. The red color is striking. A maintenance hatch is missing. You have to remove the upper side of the base unit to reach the hardware. 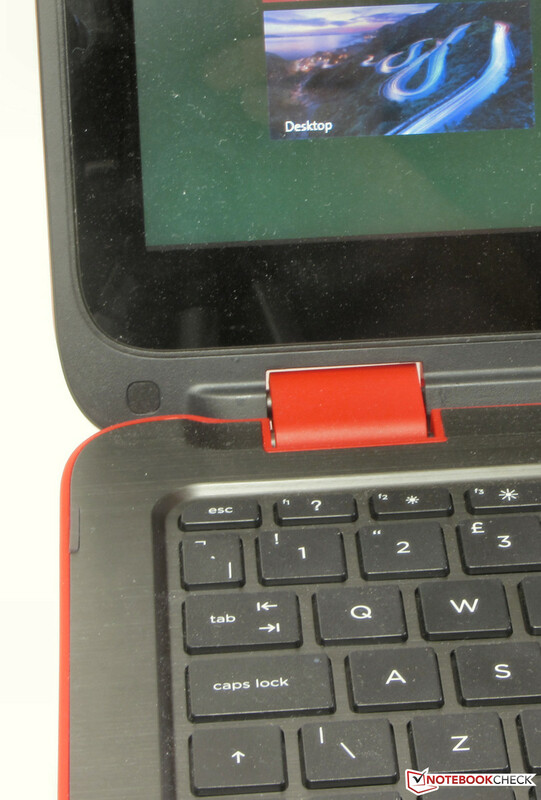 The hinges allow an opening angle of up to 360 degrees. The color of the case and the low temperature rise. 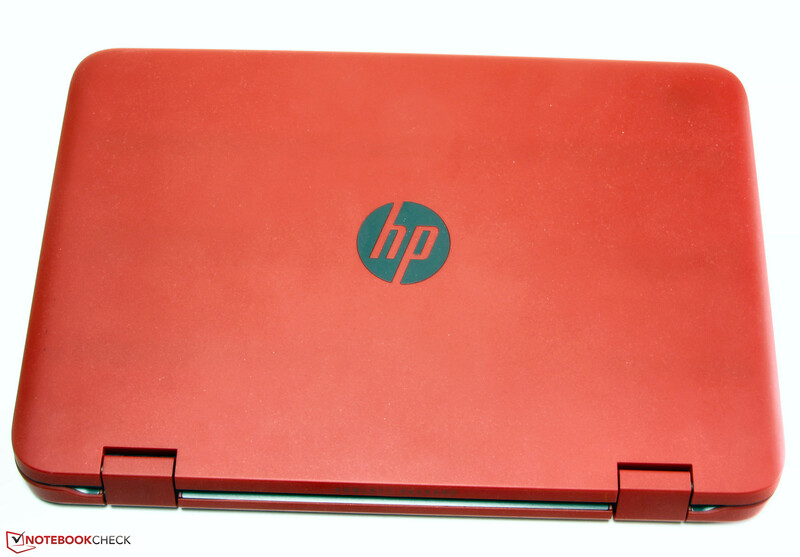 HP uses a dark TN panel with narrow viewing angles in a convertible. We cannot understand this design choice. 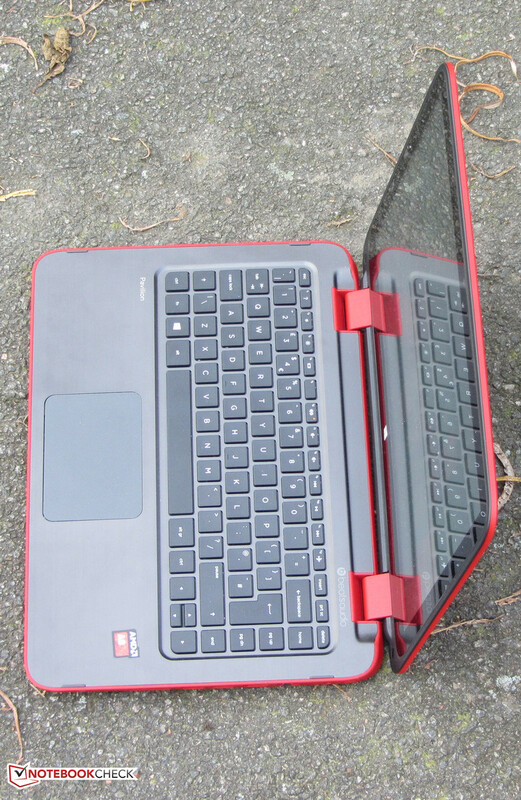 Lenovo IdeaPad Flex 14D, Toshiba Satellite W30Dt-A-100, HP Pavilion 13-a000ng x360, Lenovo IdeaPad Flex 2 15.